MINISTER DENIS NAUGHTEN has written to all supermarket CEOs calling on them to reduce their use of non-recyclable plastic packaging for fruit and vegetables. The letter, seen by TheJournal.ie, was sent to all the major supermarket chains operating in Ireland, asking them to set out what measures they could introduce to minimise the use of non-recyclable plastic packaging of fruit and veg. Naughten is currently considering a range of environmental levies on non-recyclable, single-use plastic products, such as a ‘latte levy’ on non-compostable coffee cups and plastic cutlery. Last year, he also announced that plans were underway to introduce large-scale recycling bins outside supermarkets in a bid to tackle waste at source. Before any such measures are introduced, Naughten said he wants to hear suggestions from supermarket bosses about what could be done to reduce waste. In the letter, which was sent to supermarkets such as Lidl, Tesco and Aldi, the minister highlighted that the European Commission’s Plastic Strategy proposes new laws be introduced to ensure that all plastic packaging on the EU market can be reused and recycled by 2030. Naughten said supermarket industry action would be welcome at this point, particularly in areas of product design, and where new, innovative ideas could be proposed to solve the problem of the scourge of non-recyclable plastics. The minister wrote the letter following a visit to Newtown Park School in Dublin, which has become the first plastic-free school in Ireland. During his visit to the school, he said the students called on him to eradicate the use of plastic packaging on fruit and veg. In the letter, he told supermarket CEOs that the students told him that the majority of packaging is removed straight away and put in the bin. The minister said he expected supermarket chains to respond to his letter with ideas around the development of a new policy for plastic packaging. 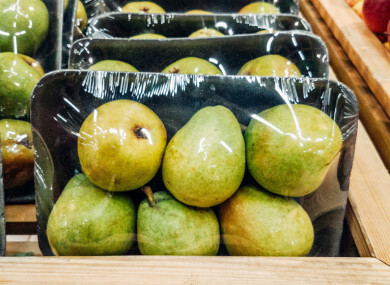 Email “Minister calls on supermarkets to reduce the use of non-recyclable plastic packaging for fruit and veg”. Feedback on “Minister calls on supermarkets to reduce the use of non-recyclable plastic packaging for fruit and veg”.